This beautifully embroidered piece by Ludi is inspired by “Lover’s Eye” jewelry from the Georgian period. The blue color around the eye symbolized the fact that the subject was deceased. How hauntingly beautiful! Oh no! 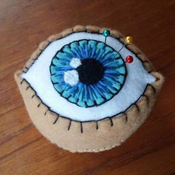 This eyeball pincushion by craftylittlemonkey actually encourages one to stick a needle in their eye! Wow. 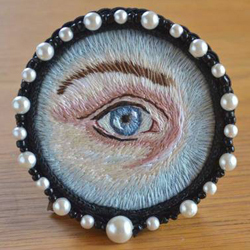 pottermouth used free motion embroidery on her sewing machine to make this realistic looking eye with a rainbow iris. 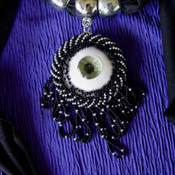 coocoosnest created this pendant and then beaded it. Once complete, she added it to a scarf to create a gorgeous one of a kind accessory. Go big or go home- this has to be the biggest eyeball I have ever seen. 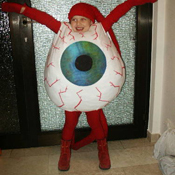 Give Tero’s husband all the credit for designing this fantastic eyeball costume for their daughter, who came up with the unique costume idea. As Tero said in her post, “no princesses here”! Want to “see” more eyes? 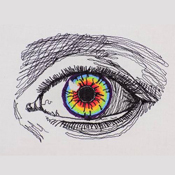 Click on the tags eye or eyeball. You are guaranteed to get an eyefull. Ooh, awesome! That eyeball pin cushion was made by my kid. I helped but it was all his idea. Little weirdo, haha.